Sometimes, a game is inseparable from where it occurs, at least on a symbolic level. Defcon 5 links its location and gameplay even more tightly, using physical space to unite a tense military defense simulation with the action of a first-person shooter. 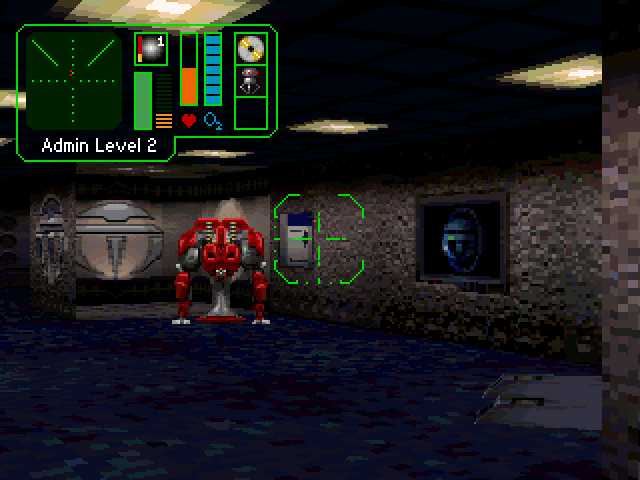 Defcon 5‘s shortcomings mostly result from the game’s specific implementation of its ideas. Millennium Interactive’s experiment suffers greatly from pacing issues, but its central concept of housing disparate genre elements in the walls of a single explorable area is strong enough to show promise between those faults. 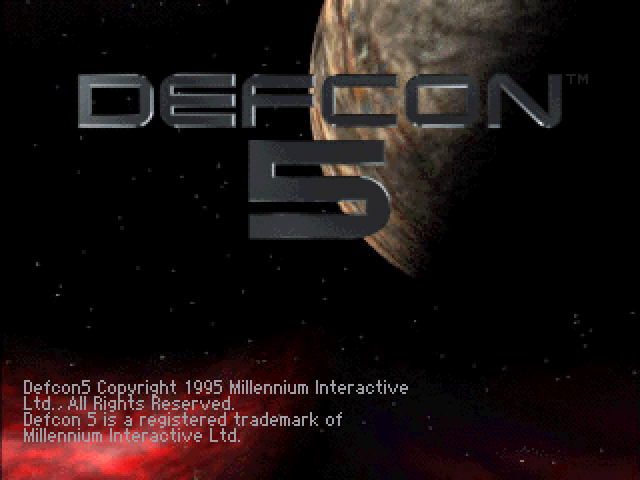 DEFCON 5 is the American military’s lowest level of alertness, and the game Defcon 5 starts in a similar peace-time setting. With no pressing defense needs, the powerful Tyron Corporation has significantly reduced their spending by automating its planetary defense systems. Tyron’s weapon division took the news poorly and, in order to justify a perpetual war budget, plans to stage an assault on their own mining installation, MRP-6F. You are a Tyron employee sent to reconfigure MRP-6F’s weapon systems on, perhaps not coincidentally, the day of the attack. Although your job only called for a routine software upgrade, the situation understandably becomes more complicated. Waves of enemies will attack MRP-6F repeatedly over time, bombarding the external structures as well as hunting you down inside. You have to fight back on both fronts. The station has a ring of defensive turrets that can be managed via Virtual Operating System terminals scattered throughout the base; these VOS displays can also check on MRP-6F’s maps, operating status, documentation, and other information necessary for keeping a lid on things. While you’re handling this, hostile Berserker robots will pour in through elevators and service tunnels. You can shoot them, but because they release airborne toxins after dying and will eventually overwhelm the area, you have to keep moving to stay alive and must resort to using whichever VOS terminals you come across. These pieces fit together as a simulation-shooter hybrid with an incredible sense of place. 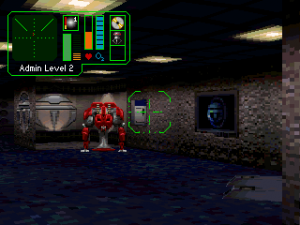 With its emphasis on managing the station through computer terminals, Defcon 5 could have existed as just an elaborate menu with occasional action segments – which still would have been clever, given the excellent quality of the VOS interface. Instead, you are constantly aware of your physical presence and surroundings. The game continues in the background while you tinker with the VOS, and periodically, an intercom will chime in to announce a wave of enemies arriving in one minute. At that moment, you have to drop whatever you’re doing, find the quickest path to the shuttle, and head to either a turret or the station’s control room. You might run into a pack of Berserkers en route, or the shuttle might be destroyed, at which point you need to look for another way around through the skyway or service halls. Often, you need to stay on the run for a while, exploring (or getting lost in) the dimly lit back corners of MRP-6F in search of additional resources while the intercom chirps in with damage reports from the security systems you aren’t maintaining. The station itself looks the part as a convincing compromise between a military installation and living quarters. Most areas contain stock industrial elements like crates and loading equipment, but the front-facing rooms depict the office space and dormitories this type of complex would need to function. These sections blend together, suggesting a utilitarian access between work and comfort that you can take advantage of. Defcon 5 never lets you forget that, whether you’re on or away from a screen, your location in the base determines your actions. The game welds two unexpectedly compatible genres together by tying them to a place. You don’t just tend to MRP-6F: you’re in it, and your ability to keep the base safe draws from how you navigate it. The battle of MRP-6F has an endgame too, and Defcon 5 doesn’t quite know how to communicate that through its brilliant melding of gameplay and space. Ultimately, you must scour the station for evidence of Tyron’s conspiracy, start a self-destruct sequence, and escape. 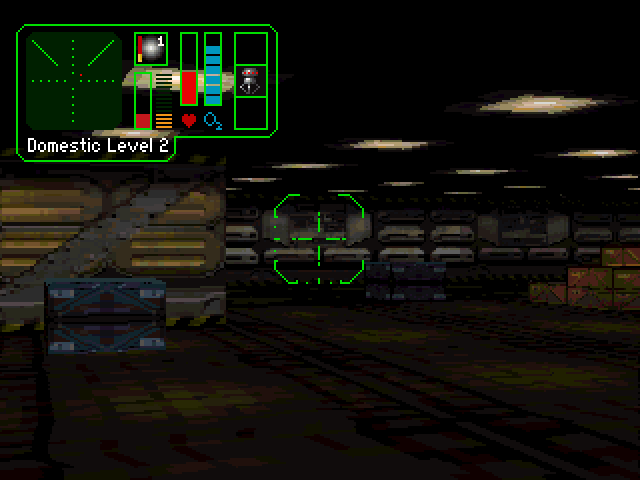 Each piece of this solution is hidden somewhere in the station, usually as a token that gives you deeper access to the VOS, but the game never brings up these objects or goals outside some allusion in the manual. In fact, most of what you can or are expected to do in the game is relegated to the manual, if acknowledged at all. There’s no problem with a game letting you go in dark and discover things for yourself, but Defcon 5 has a relentless pace that precludes the freedom to figure everything out. Success requires you to tackle your responsibilities with a methodical rhythm that doesn’t make sense without restarting the game multiple times. 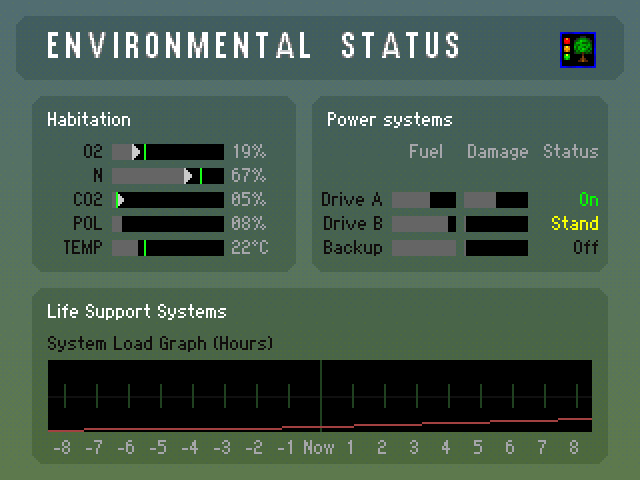 One item, for example, grants you greater control of the station’s turrets’ behavior; to use it effectively, you need to find, activate, and configure it as early as possible. This demands repetition, and Defcon 5 does not feel rewarding when retried a dozen times before learning what to do. A walkthrough can remove that frustrating learning process by indicating where to go and what to accomplish, but that also nullifies the game’s setting-driven appeal. Even with the rules clearer, though, you rarely have the time to do much. Berserkers break onto your floor quickly, and if you stand still at a VOS terminal, often less than a minute will past before they locate you. This dissuades you from any activity that isn’t critical to survival, like reading in-game documents about the Tyron Corporation which contain information that makes your mission easier. 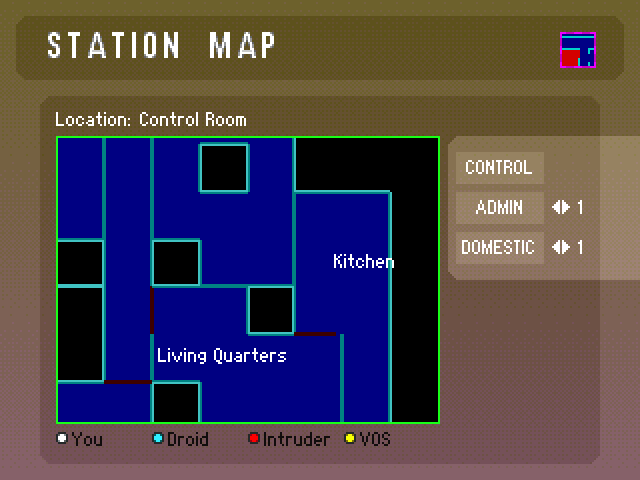 Some facets of the VOS – especially the complicated map screens that allow you to lock doors and dispatch probe droids – require much longer than a minute, putting them outside casual use. Considering how much layout matters in Defcon 5, this is a hugely missed opportunity for those functions in particular. Some of these time and convenience issues could be solved by allowing you to access the VOS while on the move, but that again wrecks the locational awareness that makes Defcon 5 a unique experience and holds its two halves together. 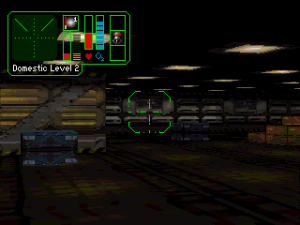 The game lives in those moments of spatial connection when, after climbing up a tower in the hunt a terminal, you check your ammunition and scan the room for exits before logging in. Perhaps the game needed less frenzy to allow its ingenious setting the room to breathe. Defcon 5 inventively bakes multiple modes of gameplay into the navigation of the claustrophobic station where it takes place, yet by expecting so much to happen within there so quickly, it constrains the player to a style at odds with a structure that encourages discovery. Defcon 5 still deserves playing for the first several attempts: before you’re aware that you’ve already probably lost, racing through MRP-6F hints at a groundbreaking intersection of action and architecture.